Dane van Niekerk picked up three wickets as Bangladesh were bowled out for 164 in opening ODI. 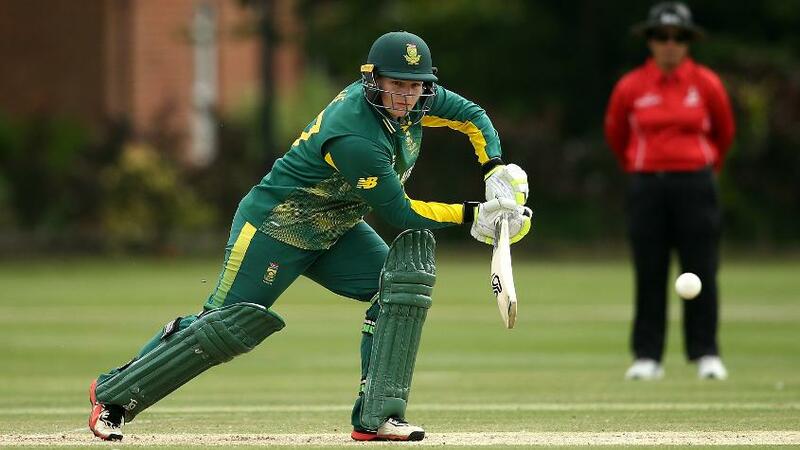 Explosive half-centuries from Lizelle Lee and Chloe Tryon, followed by a three-wicket burst from Dane van Niekerk, the skipper, helped South Africa Women trump Bangladesh Women by 106 runs in the first of five one-day internationals at Senwes Park in Potchefstroom. Sanjida Islam (35) and Fargana Hoque (69*) held steady for Bangladesh, but once their second-wicket stand was broken, none of the other batters could find their feet in a stiff chase of 271. Bangladesh were bowled out for 164 in 49.3 overs. Batting first on Friday 4 May, Lee and Laura Wolvaardt got South Africa off to a quick start, adding 62 for the opening wicket in a shade under 14 overs before Wolvaardt was castled by the left-arm spin of Nahida Akter. Lee, though, carried on in her usual belligerent self, striking the ball with ferocity on her way to a 13th ODI half-century off just 56 deliveries. Bangladesh struck back with two quick wickets. Trisha Chetty was the first one to go, deceived by the leg-spin of Rumana Ahmed to be trapped lbw for 26. Fahima Khatun then got the big wicket of Lee, bowling the opener for a 64-ball 54 as South Africa slipped to 98/3 in the 24th over. Mignon du Preez and van Niekerk steadied the ship, stringing together a 63-run stand for the fourth wicket in 10 overs. Just when it seemed the partnership would take the game away from Bangladesh, Akter struck again, getting rid of du Preez for 26. Her wicket triggered a collapse as the Bangladesh bowlers set the hosts back with regular strikes. The big-hitting Tryon came to South Africa's rescue, smashing a whirlwind 42-ball 65, which consisted of nine fours and three sixes. She was dismissed in the 48th over, but not before ensuring her side crossed the 250-mark. For Bangladesh, Jahanara Alam, Akter and Khatun all chipped in with two wickets each. Chasing South Africa's 270/9 was always going to be tough for the visitors, and it got tougher when Marizanne Kapp trapped Murshida Khatun, the debutant, in the second over for 1. Islam and Hoque forged a 63-run stand for the second wicket, but the painstaking partnership took 18.1 overs. Islam was stumped off the bowling of van Niekerk in the 20th over. Hoque then held one end up, but found no support from the others, with eight batters not managing to reach double-digits. Two run-outs did not help their cause. Hoque did well to reach her fifth ODI half-century, but the match was out of Bangladesh's grasp by then. The last-wicket pair of Hoque and Panna Ghosh defied the South Africans for 10.4 overs, with van Niekerk using as many as nine bowlers in the game. Van Niekerk was the pick of the South Africa bowlers, returning figures of 3/23 in 10 overs while Tyron weaved her magic with the ball as well picking up two wickets.